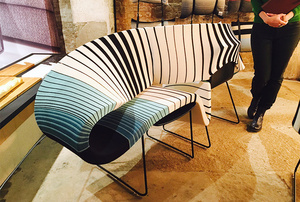 On the 25th May Eve and the team at Eve Waldron Design travelled down to London to attend Clerkenwell Design Week. We visited lots of our beloved and specified furniture showrooms, including Vitra and Carl Hansen, as well as trawling around the pop-up show rooms of the cool European designers that occupied Design Fields. Notice our new member of the team Bryony relaxing in the Arper showroom, in the comfortable Steve 1 Chair. The grounds around St James’ Church hosted Additions as well as two new exhibitions this year, Project and British Collection. It was fitting to have inspired British talent being showcased in the Church itself, underneath the barrel-roofed crypt. It was spooky and inspiring to wander underground in the basement tunnels of the former prison (The House of Detention), where Platforms was held. Perhaps by placing up-and-coming designers in this venue, evoked the sense that these companies were pushing the boundaries of design. There were some very exciting products on display. Check out the magnificent optical illusion bench designed by LEIZ (the bottom picture), they specialise in ‘knitwear for interiors’!